Musée du Fort is an undiscovered gem in Quebec City, Canada. It’s located just a few steps from the Chateau Frontenac in the heart of Old Quebec. Walking up the stairs to the second floor of the building, visitors enter a small theatre. At the front of the theatre is not a stage, but a large diorama spanning the width of the room. 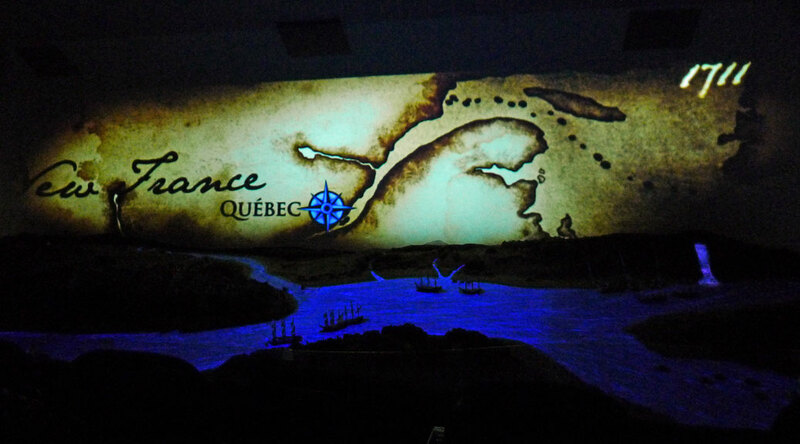 When the lights go out, a film is projected on the screen behind the diorama, recounting famous battles between English and French colonialists at Quebec City in the 1700s, which would eventually lead to the formation of Canada in 1867. The diorama, built by Tony Price, is nicely rendered and populated with model ships and figures. Battles are simulated with flashing lights and synchronized sound effects, and various areas of the diorama light up as the story progresses. Although the diorama doesn’t feature any moving parts, the special effects are impressive and the overall experience is memorable. I talked about the benefits of incorporating light and motion in dioramas in a previous post. Supplementing a diorama with a film takes that approach to a whole new level. The diorama/film combination is effective because it melds two complementary art forms. The diorama provides three-dimensional physicality, and the film provides light, motion and sound. The strengths of each art form work together to make a connection with the audience. Many diorama artists believe that a good diorama should tell a story, as I discussed here. With the aid of film, Musée du Fort takes diorama storytelling to its peak. See http://www.museedufort.com/en/ for more information. Well worth a visit.